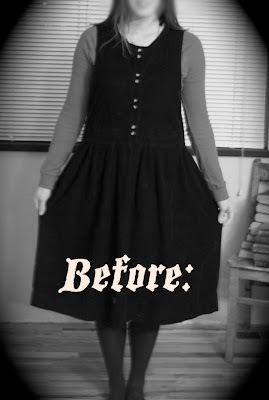 Before and After: Frumpy Dress! 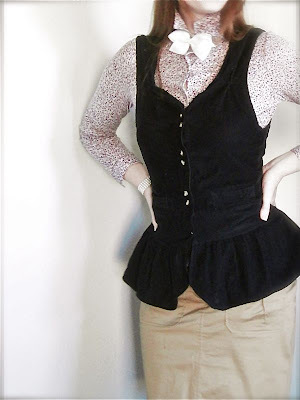 To fun little ruffle vest! All I did was hack off the bottom (then add a little of the extra fabric to the waistline, above the ruffles because I'm tall and it needed to be a little longer), take in the sides, hem, and cinch the neckline a little. Super easy! So talented. I need to learn to use the sewing machine I inherited from my husband's grandmother. Wow! What a difference! It's so trendy looking. I saw your post on Wadrobe Refashion. This is gorgeous and it looks adorable on you especially with the bow tie. I'm a sucker for any kind of peplum. I looooove what you did with the neckline there. I love it! Nice work! And your hips look fine. I am hip-y too and was happy to see that maybe I could wear it without looking too huge. Thanks for sharing a great idea! Wow! I love it! You always come up with the best refashions. Omigosh! What a great transformation! Super cute. I am a huge fan of the black long vest-thing over shirts... I'm wearing one right now! 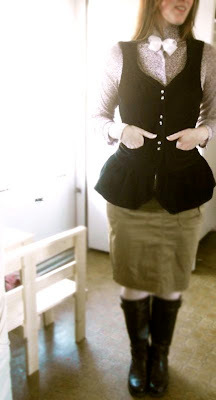 I came over from wardrobe refashion. This is terrific. I always pass those types of jumpers up. Now I'll be seeing them in a whole new light! Wow, wow, WOW! 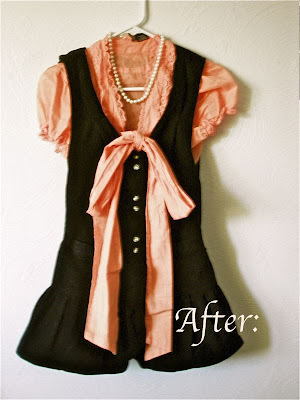 What a fabulous refashion!! I would never have thought that started out as an ugly jumper!! and in my opinion, it looks better on you than it would on a runway model. lol They aren't REAL - haha. It looks great! that is such a cute idea! what a transformation. keep it up! always enjoy it. Very cute! It's really funny; I recently refashioned an almost identical dress, but took it in a different direction and made it into a mini-dress. Your post just reminded me that I haven't shared it yet. I love how you reworked the neckline on yours! Haha, goodness, no. If I do a tutorial I always try to go into detail and take photos. I was just explaining how I did it to emphasize how easy it was! Maybe I will do a tutorial sometime though! Just love your ideas! Hope one day I can do something creative too. YES! They always have these frumpy dresses for a quarter at the thrift store! Now I will have cute little sassy vests! wahoo you!